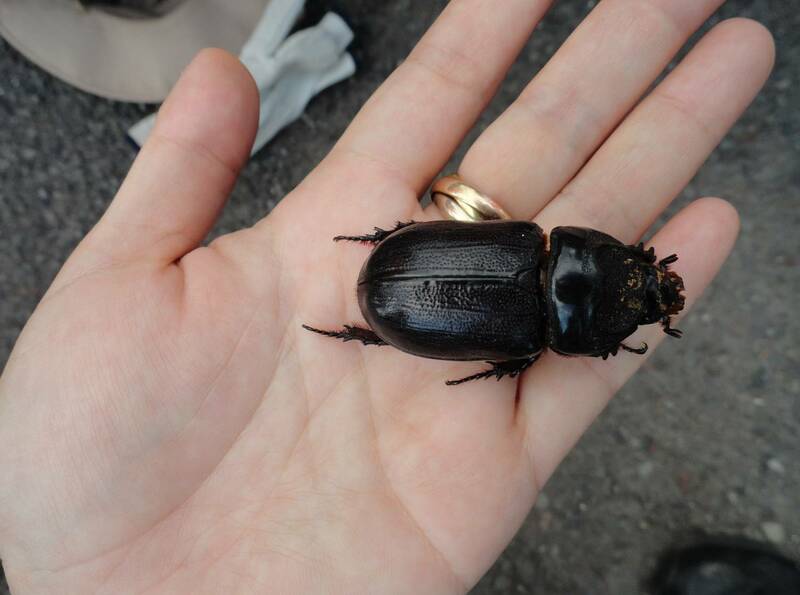 HONOLULU – Coconut Rhinoceros Beetle (CRB) survey crews from the Hawaii Department of Agriculture (HDOA) have detected an infestation of the plant-damaging beetles in small mulch piles on a farm located on Waiawa Road on the Pearl City Peninsula. This is north of the previously known infestation zone which involved mainly military property. Because this is in a residential and agricultural area, HDOA is asking the cooperation of property owners to allow CRB response crews to enter their properties to survey for the beetle, which destroys palm trees and other plants. The new infestation was found during routine surveillance activities by the CRB team. That particular area was surveyed in April 2017 and a cursory survey on June 19th found a few larvae in a mulch pile. CRB crews were immediately dispatched to the area to conduct a more extensive search. Since then, about 206 larvae and two male adult CRB have been found in three small areas. HDOA entomologists estimate that, given the developmental age of the beetles found, it is likely the eggs were laid in April. Additional barrel traps were deployed to attract CRB in the area and more extensive surveys are already occurring. Due to the new detections, HDOA is expanding the survey areas from the H-1 freeway south to the Pearl Harbor Bike Path and between Lehua Ave. and Leeward Community College. CRB response crews will be clearly identified with HDOA-issued badges and in marked state vehicles. If residents have any question about survey crews in their area, they should contact the CRB Response Headquarters at 832-0585. Currently there are 3,079 CRB traps deployed and maintained all over Oahu. 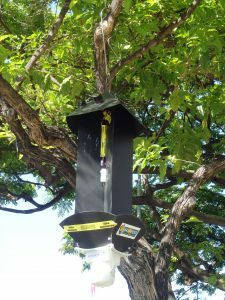 The traps, which contain a CRB-attracting pheromone, are designed for early detection of the pest. The CRB was first detected on Oahu in December 2014 at Joint Base Pearl Harbor – Hickam. So far, CRB has not been detected on other islands. Adult CRB are dark brown in color and measure 1 ¼ to 2 ½ inches long. CRB larvae are white in color with a brown head and up to three inches long. 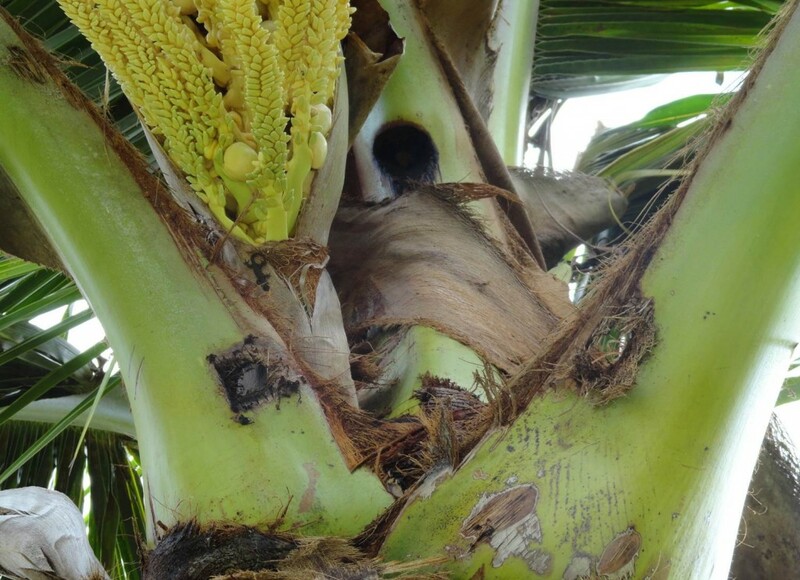 CRB are capable of killing all palm species and have been found to attack banana, taro, pineapple and sugarcane. 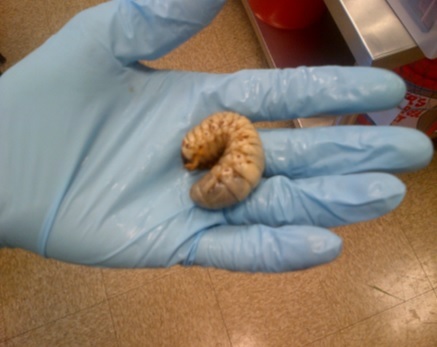 The grubs live exclusively in decaying plant material such as green waste, mulch, compost and manure. Residents on the entire island of Oahu are urged not to move any green waste or mulch from any location as CRB do not move long distances on its own, but may be transported by humans. Oahu residents are also asked to inspect their mulch piles periodically for CRB larvae and adults. Currently, the CRB team involves 27 staff which conducts surveys throughout Oahu. The program is funded by the U.S. Department of Agriculture (USDA), Hawaii Invasive Species Council (HISC) and HDOA. Headquartered at HDOA’s Plant Quarantine Branch, the team includes personnel from several agencies, including USDA, the U.S. Navy and Air Force, Hawaii National Guard, HISC, Oahu Invasive Species Committee, Department of Land and Natural Resources, and the University of Hawaii – College of Tropical Agriculture and Human Resources.